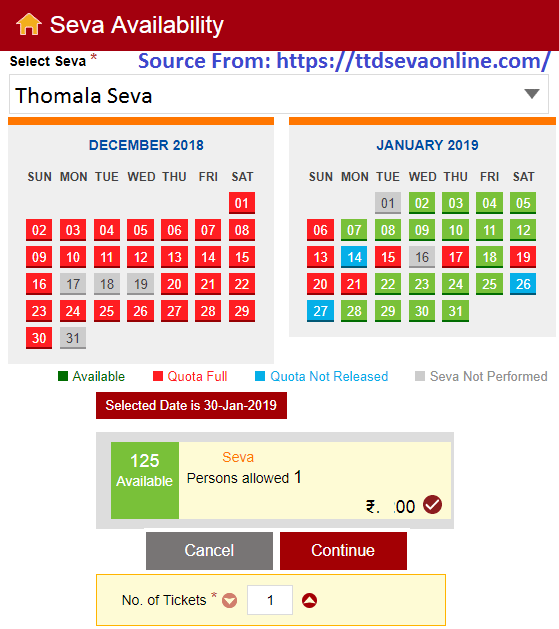 Booking process on Tirumala Tirupati Devasthanams TTD Nijapada Darshanam Seva Tickets Online Booking and Seva Timings at ttdsevaonline.com…. ‘Nijapada Darshanam Seva’ is a once in a week performed seva of Lord Balaji at Tirumala. The seva invites thousands of devotees to see the feet of Lord Srinivasa without any ornaments. On every Friday, devotees can see lord Srinivasa wearing a simple white dhoti and nothing in the feet. 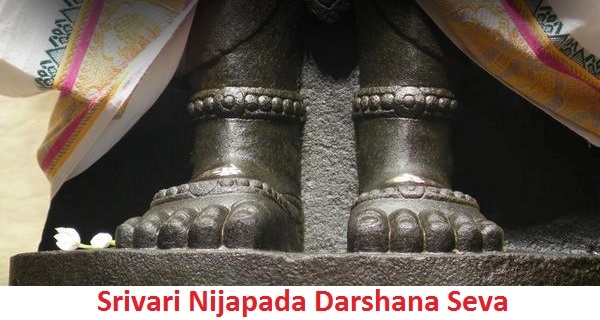 Normally the feet of Lord Srinivasa are covered with Tulsi leaves but on Friday they are kept without Tulsi leaves because of Nijapada Darshanam. Lord Vekateswara gives darshan to the devotees without camphor as camphor is applied after Nijapada Darhanam. Lord Venkateswara is always decorated with flowers and Tulsi garlands. Sri devi is etched on right side of his chest and Bhu devi is etched in the left side of his chest. The left hand of Lord Venkateswara is in katiyavalambitha pose which means that thumb and fingers are parallel to the wrist. He pose means that their troubles in life while the devotees seek to refuse thus and also asks for protection from lord. Nijapada seva is conducted on every Friday of the week in the early hours of the day which is 5:30 AM to 6:30 AM. While the devotees are supposed to gather for the seva 1 hour before this time at Supadham. The Nijapada Darshanam costs around Rs.200/- per person and a person is allowed to book a maximum of 2 tickets at one time. Along with the booking, a person gets 2 laddus per booking. Devotees can also buy Abhishekam Tirtham at Vagapadi office. On every first Friday of the month, the Nijapada Darshanam Tickets are released. 300 tickets are available for online booking while remaining tickets are available at CRO office one day before. For the seva, people have to wear the traditional dress which is: For men: Kurta Pajama or Pancha or Dhoti while for women it is Saree, or a suit with dupatta. 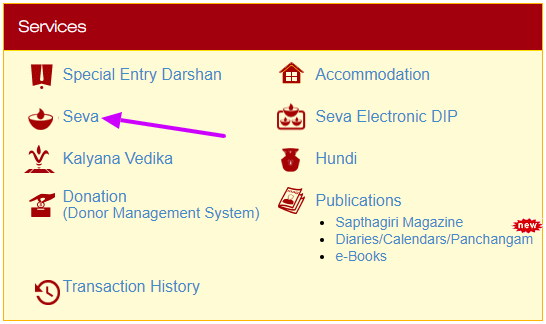 Following is the step wise procedure for online booking of Tirumala Nijapada Seva Darshanam tickets online. 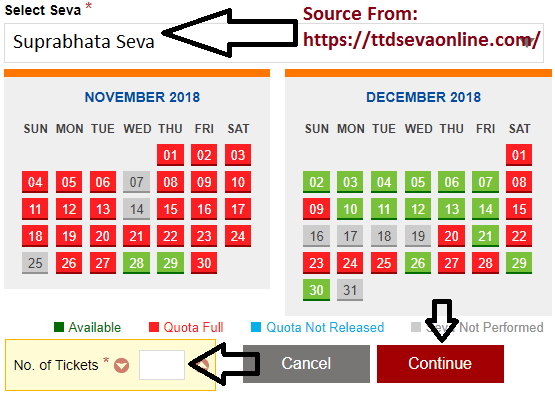 The ttdsevaonline.com has been designed to provide every assistance in the booking of the darshan, other sevas as well as accommodation etc. One needs to create an account on the website by giving their details. The logging credentials thus created can be used to login to the page. Step 2: After logging to the website, the person would be directed to the second page where the user would have his credentials at the top which are entered while signing in. On the right side of the page, all the options and different services that the user can perform are listed. One needs to click on ‘seva’ for making a booking for ‘Nijapada Darshanam’. 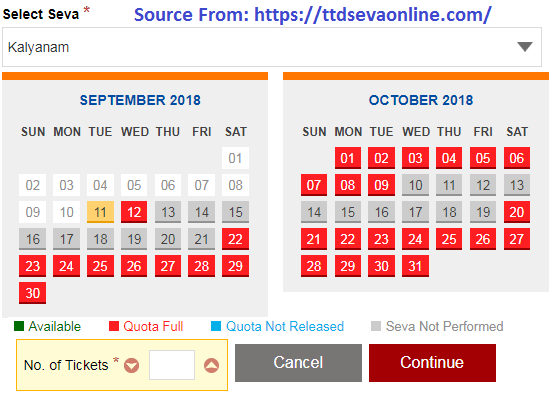 Once you click on seva, you would be directed to the next page where the user needs to provide the details like selection of the seva from the drop down. Selection of the preferred date, there is a calendar available at the bottom which denotes the various available dates for the seva denoted by green color, one can select his preferred date from there. After this one can select the number of tickets which are a maximum of two for Nijapda seva per day. One should also read the instructions provided at the top before clicking on submit. The instructions include the requirement of identity proof along, the dress a person is required to wear during the seva, the time and duration of darshan etc. After making relevant selection, the person can clock on “continue”, which will direct the person with details of the seva selected, date and time. Here the person is required to put the details of the pilgrim along with him. The details include, name, age, gender, photo-ID proof and its number etc. The form would also have the details of the email-ID and mobile number at the bottom. These are the same which are presented while creating an account during sign up stage. The same details will be used for giving any notification or any update related to the seva. After making all the selections and reviewing it once, the person can click on ‘continue’. After clicking on ‘continue’, the person would be diverted to the payment page. This page would have all the details of the pilgrims and the payment options for making the total payment. The person can make the payment by selecting the desired payment option like the debit/credit card or internet banking option. One can simply select the desired option and make the requisite payment for the ‘seva’. The person would receive a reference ID which should be kept for any future reference, Along with this the person will also receive an e mail and a SMS with all the details. Tirumala Tirupati Devasthanams TTD User Login Creation / TTD Seva Online Login Registration for Online Seva Tickets Booking or Tirumala Rooms Booking at ttdsevaonline.com…..
TTD New User Signin or TTD User Login registration is very important for every devotee. Because every devotee had confused how to create new user in Tirumala Tirupati Devasthanams (TTD) website i.e https://ttdsevaonline.com/. TTD Seva Online Login Registration is dead easy to create TTD New Login registration. In this article we will give the detailed procedure on it. Tirumala Tirupati Devasthanams (TTD) officials to make the procedure smooth for the pilgrims TTD has launched an online TTD booking facility. User needs to register on this website for availing any type of facility which could be booking of darshan tickets, checking slots for seva or making bookings for accommodation at Tirupati. One can easily do an advance booking of up to 3 months. Arjitha / Daily Seva tickets at the temple. Avail TTD lucky dip seva registration every month. Booking of accommodation during the visit to Tirupati which includes booking of hotel rooms, guest houses, temple cottages etc. in Tirumala and Tirupati. Book publication, register for subscription etc. One can avail the services for self as well as make a booking for someone else. One can register on the website as an individual account or create an account on the name of institution. An ID proof which could be any legal proof of residence e.g. Aadhaar card, voter ID card, driving license, passport or any government issued ID card. One should also have scanned passport size photo as per the size which is allowed on the website. The user should also have a valid Email ID and mobile number which can be used as a source of verification as well as used for communication purpose during the booking. On the right side of the page, there is an option for sign up for the new user. Once the user clicks on the sign up page, the user will be diverted a user registration page where a first time user needs to provide all the details. 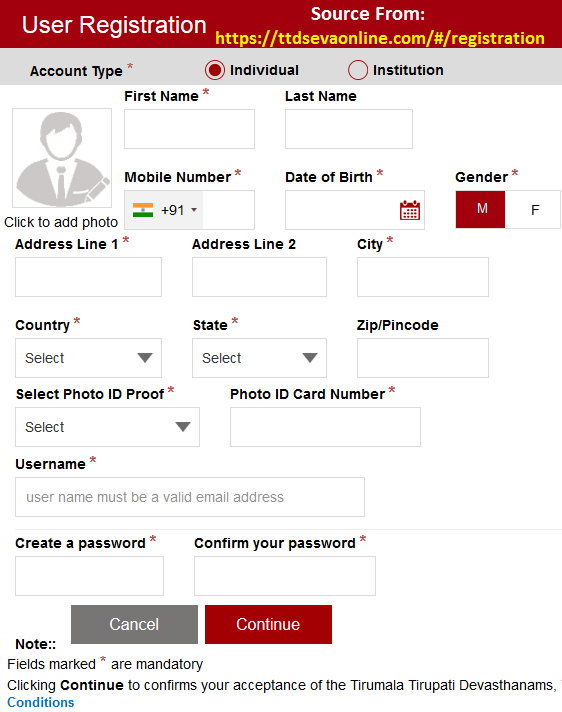 One needs to select the account type individual, if the person wants create an account for self or institution if the person is a volunteer of institution. First name, Last name as per the identity proof. Mobile number – here the person should provide the mobile number which a person wants to use for communication purpose. Date of Birth –here the user needs to give select the date of birth as per the official identity proof. Address – The current residential address of the person which should be the complete address including the pin code. Select the photo ID proof which the user wants to provide from the drop down. After this the user needs to type the user ID which should be the valid email ID of the person. Create the password for the secured login to the website. After this the person also needs to upload a recent passport size photograph on the website, the size of the photograph should not be more than 10 kb. After all the details are given and email id and password is provided, the user will receive an authentication link on the registered email ID as well as the user will receive an OTP on the registered mobile number. This is done for the authentication purpose. Once this is done the registration of the person on the website is complete. One can use the credentials anytime for booking for a special darshan, seva or an accommodation during visit to Tirupati. After successfully created the TTD User Login Creation or TTD New user login registration everyone must login into your TTD Seva Online Login. After you can try to Book Tirumala rooms online booking. In case a person has forgotten his password, it is very easy to recover the password by going to the home page of TTDSEVA and clicking on ‘forgot password’ present below the login details. Once a person clicks on ‘forgot password’, the person would be directed to another page where he needs to enter the registered email ID. A password reset link will be sent on this email ID, the person can simply click on the link to reset the password. In case dome suspicious activity is observed on your account, your account would be locked temporarily, you can unlock your account through OTP validation on registered mobile number.